Willart, collaborator to El Chigüire Bipolar has his own blog. 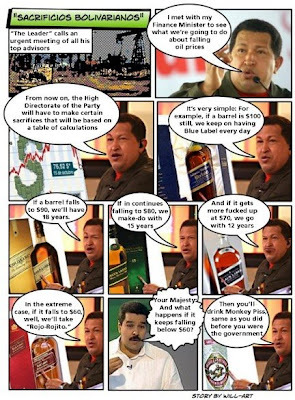 Recently he put an hilarious take on Chavez austerity measures to face the crisis, basically based on what quality of Scotch will his administration be drinking according to oil prices. I did not mention it and even less translate it because I had no time for it, not to mention that the translation would not be as good as the original. But still, a reader, BW, did it for fun and sent it to me. Yes, the translation cannot be as good as the original but I trust you will get a big kick out of it. Click to enlarge.